Exciting news: formation of a new club in Central Iowa is getting closer! Thanks to Sue Witt, there will be an organizational meeting September 8th as shown in her notice below. Thank you Sue! Looking forward to the meeting. Hello, my name is Sue Witt and I recently attended Region 21 Fall meeting in Sioux City. I expressed interest in central Iowa having our own affiliate organization. We have many iris lovers in this area, who are knowledgeable, supportive individuals, with a desire to share information with the public and each other. With encouragement from attendees at the regional meeting, an awareness of previous efforts, and a belief we will be successful please join the newly established Heart of Iowa Iris Growers affiliate. Our first meeting is September 8th, 7pm at our home-2649 Moonlight Dr, Des Moines, 50320. We live in Three Lakes development off of Army Post Rd between Indianola Ave and IA 65. My phone number is 702-498-6413. I volunteered to be President, Pam and Wayne Messer volunteered to assume any office assigned (Pam Messer is Vice-President and Wayne is Treasurer). I will be asking Kristin Jurik to be secretary. AIS members are eligible to hold office and additional opportunities will exist. I am excited about our affiliate and anticipating a great meeting. There will be dessert! The Lincoln Iris Society has its annual Iris Sale and Auction this Saturday, July 30, 2016. Bearded irises and other perennials including daylilies will be available. The sale is open to the public from 10 a.m. to 4 p.m. at the St. Andrews Lutheran Church, 1015 Lancaster Lane (4 blocks east of 70th & Vine, left onto East Avon, church is on the left). An auction of the new varieties begins at 11 a.m. There will be iris growing information as well. For more information contact Gary White at (402) 613-1159. Learn more about iris growing and the sale in this article in the Lincoln Journal Star. 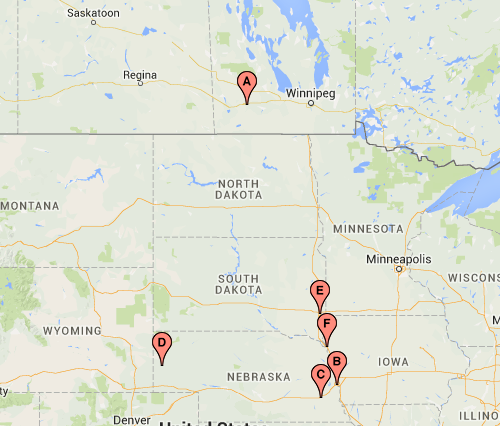 Region 21 has 6 Clubs located in Iowa, Nebraska, South Dakota, and Manitoba. You can find your closest Club on this map. Or see these in a live Google Map at BatchGeo. See the Who We Are page for links for some of these and the AIS Region 21 Affiliates page for contact information. The Greater Omaha Iris Society Iris Sale is Friday, July 25th at St. Andrew Church. We will meet at 11:00 AM to set up for the Rhizome Sale. Meet at St. Andrews Church to help set up for the sale. Lunch will be provided. Then from 2:00—8:00 PM is the Annual Rhizome Sale. Members are needed to answer questions, check out customers, and help take down the sale. Please consider donating iris from your garden. GOIS offers sales credit for all donations. Rhizomes must be cleaned, trimmed, and named varieties. Contact Linda Wilkie if you have iris you can donate so that sale tags can be prepared. our success and very much appreciated.